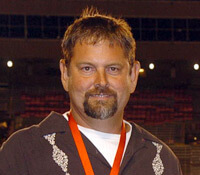 Inducted as part of the DCI Hall of Fame class of 2006, Tom Aungst, spoke to family, friends and other members of the drum corps community last year at the official Hall of Fame luncheon ceremony in Atlanta. A member of the Cadets from 1981-1984, Aungst went on to become a lead percussion tech with the corps from 1985-1988 before assuming the caption supervisory role in 1989, a position he still holds today. These video highlights of Aungst's speech, include an introduction by Cadets Director George Hopkins, who is a 1997 Hall of Fame inductee. Next weekend, joining Aungst and the more than 75 other members that are among the elite of the DCI Hall of Fame, will be the four new members of the Hall of Fame class of 2007. Those individuals will be recognized during the DCI Annual Meeting & Conference Weekend on Jan. 26 in Orlando. View all members of the DCI Hall of Fame.